If you own an iOS device (iPod Touch, iPhone, iPad) then you can now download the Skype Wi-Fi app and get access to over 1 million Wi-Fi networks around the world. Regardless of where you are, and what degree of access the Wi-Fi network may carry, with Skype Wi-Fi you are in. 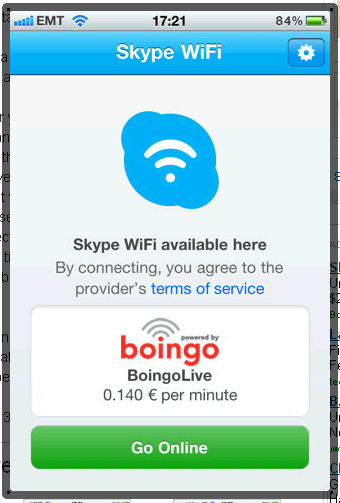 Pricing for the new Skype Wi-Fi starts at 6 cents per minute of data access, and there’s no limit to the amount of data you can consume with your iDevice. Simply launch the app, login to Skype, tap the “Go Online” button, and surf away. For those who own the iPhone or iPad, Skype is reporting that your device must be running iOS 4.1 or above. And to get you excited and engaged with the new Skype Wi-Fi service, Skype is offering up to 60 minutes of free Skype Wi-Fi between midnight August 20th and 11:5pm August 21st (BST). Use Skype WiFi to connect to WiFi hotspots at hotels, airports, train stations, bars and restaurants – available at over 1 million hotspots worldwide. Just one tap to connect – then browse the internet, check email, use Skype, check Facebook, update Twitter, upload photos, download music or ebooks. Only pay for the time you’re connected – there are no limits on the amount of data you can upload or download. Get the free Skype Wi-Fi app by clicking here (iTunes link).